1) The theatre in the distance with the domed top was used in Spider Man. 2) This little patch of grass was portrayed (somehow) as Central Park in Friends, whenever an episode called for something to be shot there. 3) The Warner Bros. museum. Unfortunately you can’t take pictures inside, because there was some really cool stuff. There were a lot of costumes from a bunch of Warner Bros. movies. There was Batman’s suit worn by Christian Bale in The Dark Knight, along with Heath Ledger’s Joker attire, as well as the nurse outfit he wore towards the end of the film. There was also outfits worn in The Matrix, The Departed, The Town, Where the Wild Things Are, Training Day, 300, and many others. The whole second story was devoted to Harry Potter, but Dustin and I didn’t really have any desire to go up there. Simon had already gone back to work and we weren’t supposed to be there without him, so that was another reason to head out. 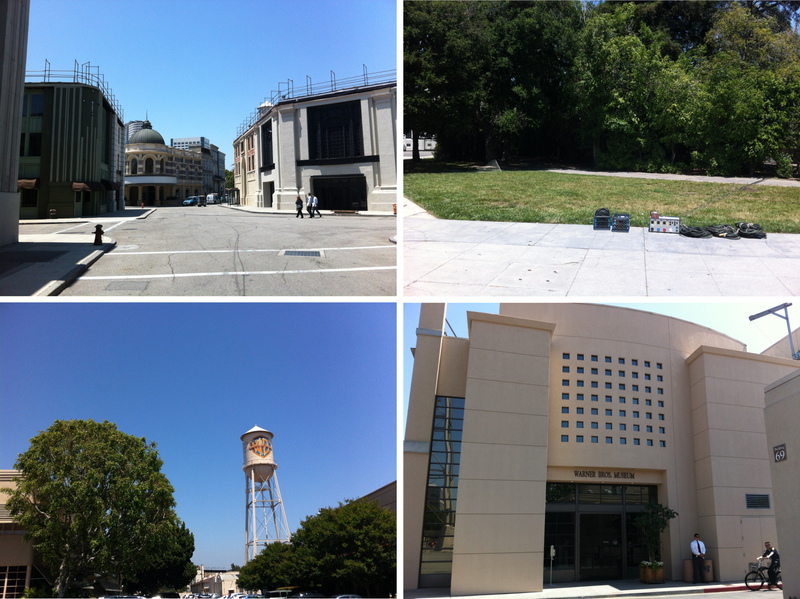 4) The Warner Bros. iconic water tower. After leaving Warner Bros. we went back to Simon’s place and got ready for the game. 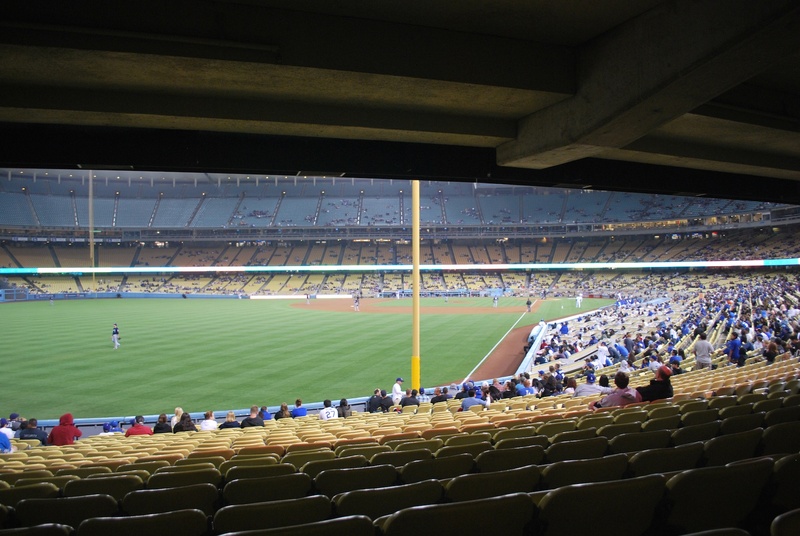 Adam McCalvy had told us to meet him at Dodger Stadium at around 5:30, and that was our original plan. Dustin and I got to the Dodger Stadium parking lot entrance around 4:55, but they don’t open the parking lots until 5:10 for 7:10 games. We were one of the first cars parked, and while doing so we saw some people in Braun shirts/jerseys. I swore one of them was Joe Braun, who I met on April 30th in San Diego. Dustin and I hustled and got our stuff and caught up with them as they went up the staircase outside of the left field corner. I said Joe’s name and he turned around (and luckily) remembered me and introduced me to who he was with. He had told them about me prior to Wednesday, and said that he still had my phone number, so that was cool. Braun’s mom Diane was there as well, and I think she was more excited to meet me than I, her. She got a picture taken with me and sent it to a friend with “I MET THE BLOGGER” as the text. I told Joe that we were going to meet up with Adam McCalvy, and Joe asked if we wanted to just go in with them. 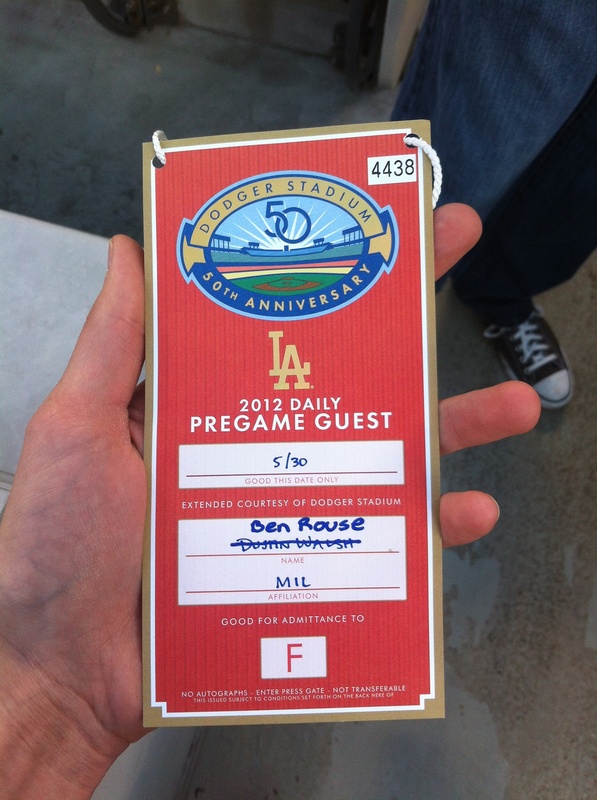 Dustin and I couldn’t turn that down, and we went in on the Club Level, and proceeded around towards home plate. They have some old memorabilia in the club level, but we were trying to keep up with everyone so I just got a few pictures. 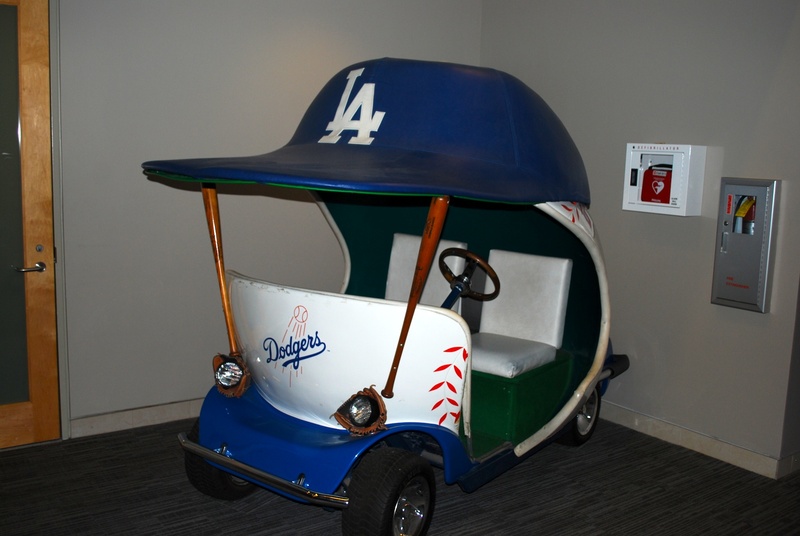 This was the former bullpen car, which the Dodgers would use to bring in a reliever (they had it so easy back then…). We went on the field, and it was awesome just being out there during batting practice. The Dodgers were just finishing up their BP session, so I was able to chat for a bit with Tim Dillard. He’s a reliever for the Brewers, and I mentioned him in the first post in Phoenix when I shouted a Harry Caray impersonation his way. Adam reads the blog and had told Dillard about the guy who yelled that at him, so he was already familiar with what I was doing. He told me that people (obviously) yell stuff at him all the time, so in Phoenix when when I yelled he was a little reluctant to look up. Once he saw it was a Brewers fan, though, he was cool with it. He’s a really nice guy, and we talked for five minutes or so before he had to take off and shag fly balls during the Brewers portion of BP. I couldn’t pass up the opportunity to get a picture taken with him, and he graciously agreed. When the Brewers started taking batting practice, Dustin and I just took it all in and we talked with Adam (and others) about baseball. 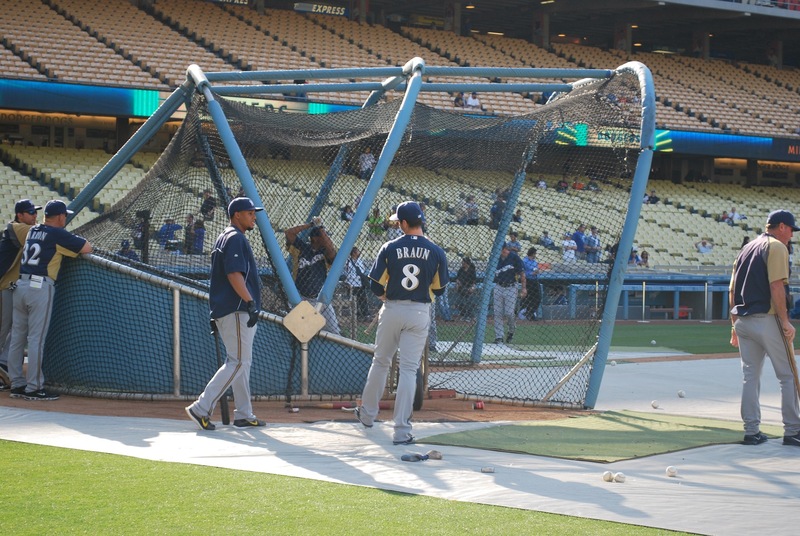 Gomez and Braun were laughing about something outside of the cage, and it was exciting being so close. Jon Gries, who played Uncle Rico in Napoleon Dynomite, is friends/neighbors with Randy Wolf, and he was out on the field during BP. We talked with him for a bit and told him about what I was doing. He is also a really cool guy, and I found out that he appeared in a few Seinfeld episodes, a show that I’ve seen every episode multiple times and own the box set. I failed to get a picture with him and I’m kicking myself now because he probably wouldn’t have had a problem with it. 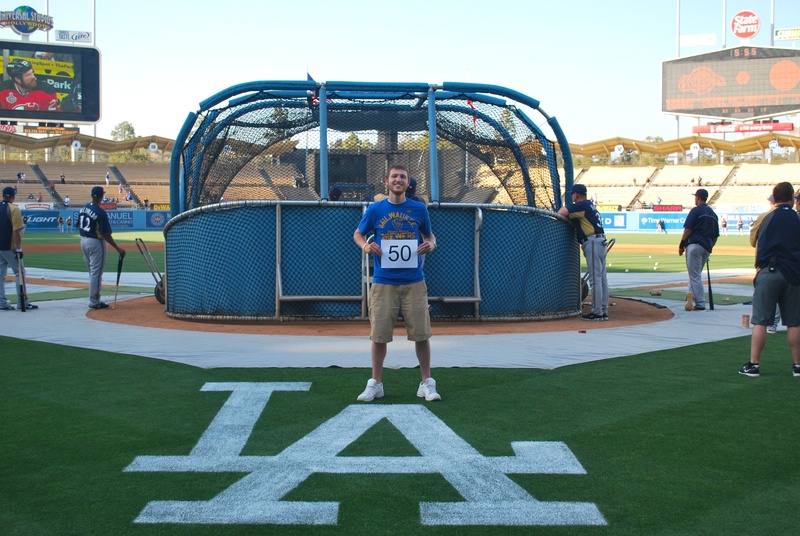 Since we were out there, I figured I should get the game number picture taken on the field, and while the Brewers were still hitting I had Dustin take game photo number 50. I can’t believe we’re 30.8 percent of the way through the season! I got the above picture taken at about 5:55 pm, and we were still on the field 40 minutes later. 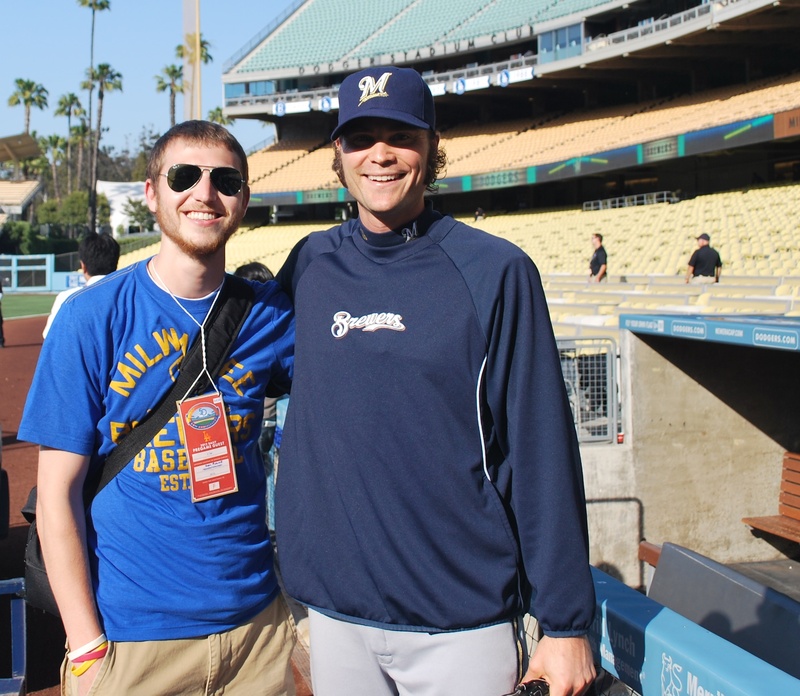 Mark Attanasio was down on the field and Adam introduced me and Dustin to the Brewers owner. Tom Haudricort (a sports writer for the Milwaukee Journal Sentinal) and Adam kind of started an impromptu interview with Attanasio as Dustin and I stood there. It was fun/weird to hear the questions, see them write down the responses, and then see them in quotes in Adam’s article later that night. The National Anthem was about to start, so we parted ways with Adam, he to the press box, us to some free seats down the first base line. This was the view as the game was about to start, and I realized it would be a tough to not miss a pitch. 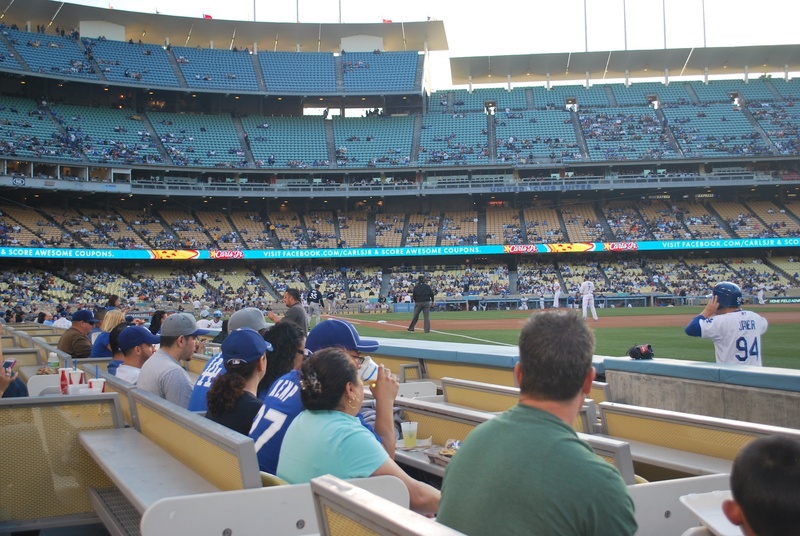 The seats aren’t angled towards home plate, so it takes discipline to stay swiveled around in your seat (or straining your neck to watch the action in the infield). It also didn’t help to have all the other fans on the same plane. Nonetheless we were just feet from the field, and it was great being there. Adding to the difficulty of a perfect game was the first basemen’s positioning before the pitch. 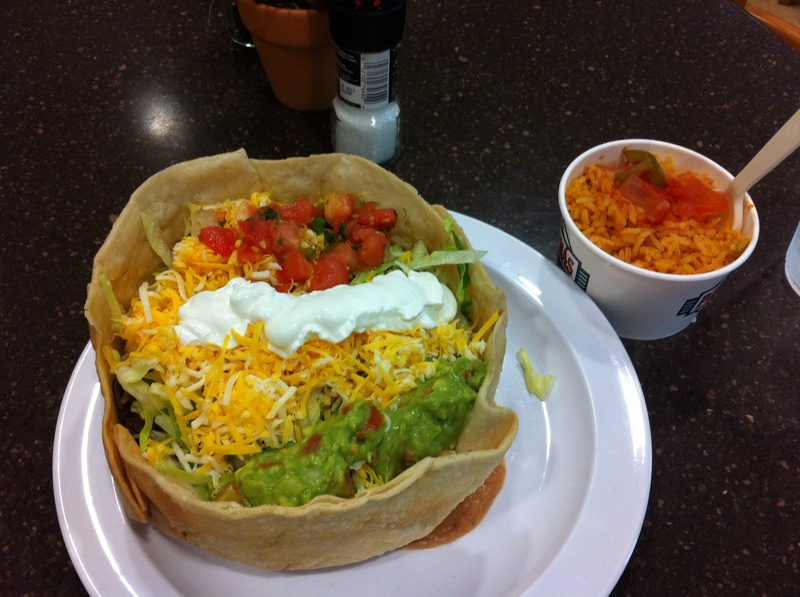 The picture below was taken in the bottom of the eighth inning and shows what I’m talking about. I WAS able to pull off a perfect no-pitches-missed game despite all of that (I’m patting myself on the back while typing). As for the game, it held up to how great the day had gone up to that point. The Dodgers scored a solo run in the first, but it could’ve been a lot worse, as they stranded the bases loaded. The Brewers tallied twice in the fourth inning, with both runs scoring on a single by Carlos Gomez. The Brewers added three in the sixth inning and took a 5-1 lead. A safety squeeze by Maldonado scored Weeks then Gallardo just narrowly missed a home run but still drove in a run. The hit wound up as a booming single because it ricocheted off the wall so fast. An infield single by Aoki drove in the final run of the half inning. 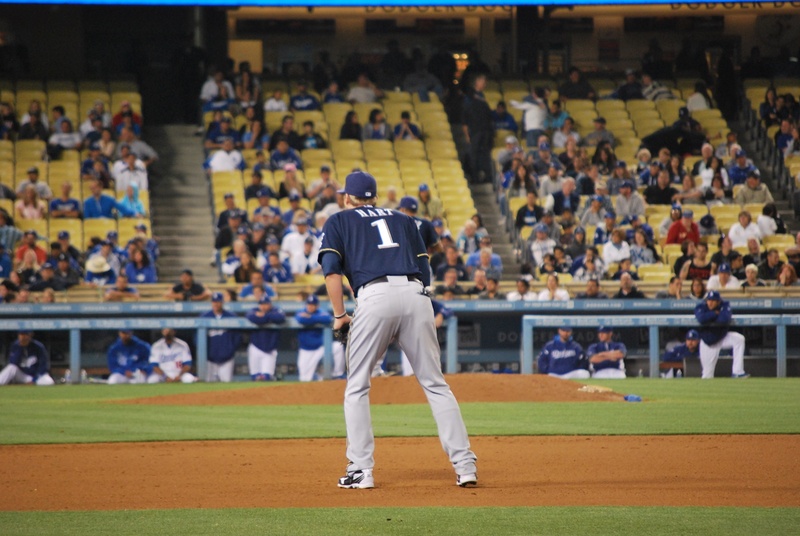 The Dodgers loaded the bases on Gallardo in the bottom of the seventh, and was subsequently relieved by Manny Parra. The first pitch Parra threw resulted in a two run single. He got out of the jam without surrendering the lead, however, after striking out Loney and inducing an inning ending double play. A botched double play attempt by the Dodgers in the top of the eighth resulted in another run, and that concluded the scoring. Final Score: Brewers 6 – Dodgers 3. Taking the first three games against the Dodgers is huge, seeing that coming into the series they were far and away the best team in the N.L. up to that point, and they still own the best record in all of baseball despite losing three straight. It’s their first three game losing streak of the season, and I’m proud that it came at the hands of the Brewers, especially since it came at Dodger Stadium. Dustin and I watched the bottom of the ninth from the left field corner, so we could get to the car as quickly as possible. It’s easy to get stuck in post game parking lot traffic, and we wanted to see how well the plan worked. Tomorrow night we’ll be doing the same thing because I could be cutting it close with my red eye flight back to Milwaukee. As you can see from the picture below, most everyone had left (in a measly 3-run game) so we likely didn’t need to be so strategic. I have to give a shout out to Adam McCalvy for extending the invite to take in batting practice from the field. Another, perhaps bigger shout out, goes to Mike Vassallo, the Brewers Media Relations Director who helped get me and Dustin the field passes. You guys are great, and I appreciate the support in my mission, and making it even better than expected. We’re leaving for the beach shortly, then returning to Simon’s to gather our stuff and get ready for the game. Dustin is taking me right to LAX after the game to catch my 12:40 am flight and he’s driving through the night to set up camp at Zion National Park in Utah. I’m not sure when I’ll post about Thursday, but I’m thinking I’ll have some time at the airport or when I get back home to the great State of Wisconsin. Thanks again for those who have donated, and those that have joined the registry. It’s awesome to see that what I’m doing is making a difference, and it wouldn’t be possible without you.